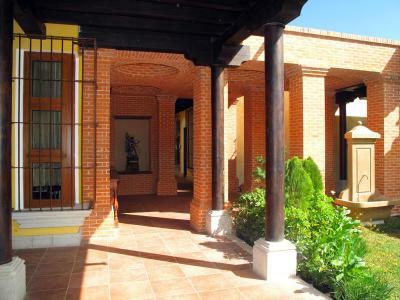 Lock in a great price for Camino Real Antigua – rated 9.1 by recent guests! Excellent customer service specially the gentlemen at the entrance and the waiter/waitress at the restaurant and bar. The hotel is clean, gardens are well maintained, coffee and water available at the corridors. Armando picked us up from the airport and he was helpful and kind, very gentle given my mom is 85. He gave us directions , tips and a history overview . Thank you Don Armando. !The breakfast buffet offers a large variety of cold and hot dishes, we had breakfast there a couple of time once we got familiarized with the area we had our meals outside. It is expected to be more expensive than outside but the service is very good. There was a tremor one of the nights first I got scared but then I remembered this is a new construction not like the adobe old houses at the center of the city which gave me peace of mind and went back to sleep. Thank you all for the excelente customer service! I cannot wait to comeback ! The reception staff, bellboys, cleaners and restaurant staff were all professional and friendly. The room was lovely with comfy beds and quality linen. The bathroom was pleasant and conplimentary bathrobes to wear to jacuzzi. The breakfasts were truly excellent for an extra $21 per person per day. It is a nice quiet location that is close to colonial square but not too close. 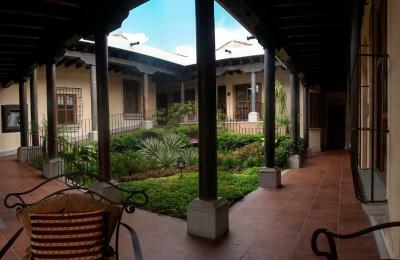 The hotel felt very safe, comfortable and an oasis after walking around the interesting city of Antigua during the days. The hotel is tastefully and creatively decorated throughout. 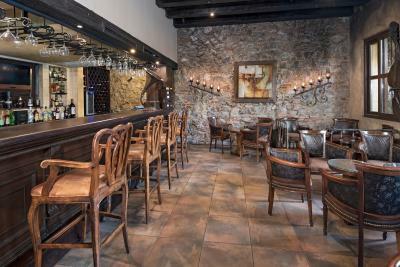 Coffee stations, clean and comfortable room, the restaurante is very good. This property is really a beautiful setting, and the staff was quite professional and friendly. Really nice hotel. The beds were super comfortable. The grounds are very well kept and very pretty. The staff were super helpful and the jacuzzi was amazing. 100% staying here again. Friendly staff and nice property, really comfortable. Camino Real Antigua This rating is a reflection of how the property compares to the industry standard when it comes to price, facilities and services available. It's based on a self-evaluation by the property. Use this rating to help choose your stay! 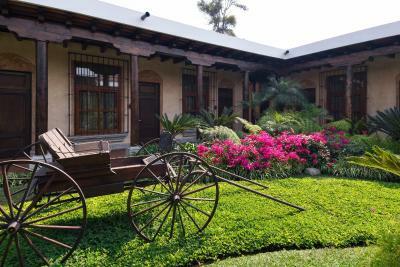 One of our top picks in Antigua Guatemala.Camino Real Antigua is located in Antigua Guatemala, about 30 minutes’ drive from Guatemala City. The hotel has an oversize hot tub and a gym. Antigua Guatemala, a UNESCO World Heritage Site, is famous for its Baroque architecture. The Central Park and Cathedral are just 6 minutes’ walk away from the hotel. The luxurious and spacious rooms and suites in Camino Real have a flat-screen TV, iPod dock and laptop safe. They also have a mini-bar, Wi-Fi, and a bathroom with bathrobe and slippers. All rooms look onto the attractive gardens. There is also a terrace with sun loungers and Balinese-style beds. When would you like to stay at Camino Real Antigua? These luxurious and spacious rooms have a flat-screen TV, laptop safe, mini-bar, Wi-Fi, and a bathroom with bathrobe and slippers. The look onto the gardens. 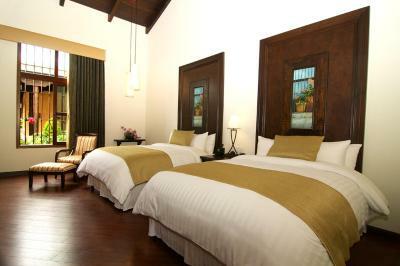 These luxurious and spacious junior suites have separate lounge and sleeping area. They have a flat-screen TV, laptop safe, mini-bar, Wi-Fi, and a bathroom with bathrobe and slippers. The look onto the gardens. House Rules Camino Real Antigua takes special requests – add in the next step! Camino Real Antigua accepts these cards and reserves the right to temporarily hold an amount prior to arrival. The rooms were all facing inwards. Thats so depressing. Very minimal natural lighting. Had to switch on the lights even in the day. Compared to this the Santo Domingo hotel has better spread out rooms with balconies etc. Breakfast was good. Big spread but was charged extra. One of the best breakfast buffet I have ever seen. Beautiful hotel grounds and rooms. So nice to take a jacuzzi before going to bed also. Very little room on side of both beds. Two comforters were too heavy and hot. The hotel is very pretty in every detail. Property does not answer your questions prior to arrival and when it does, messes up with other people's questions. Clearly, they are not into emails, internet and stuff. Just before Xmas 2018, the restaurant reopened after some renovation work. Seems we were guinea-pigs. They arranged a mini table for our Xmas dinner where we just didn't fit. Food savory but with a reheating feeling. And then, two in our party got mildly sick to the stomach! Just don't eat there. Rooms are comfortable and nice. Beds very comfortable. Bathroom particularly pretty and functional. The free hot coffee and ice lemon-water on the corridors is very welcome when coming back from a long walk. The noise was coming from the center of the court. There's nothing much you can do when people speak loud at night in a communal area. I must say that my first booking made through booking.com which had a suite (i.e. a room upstairs) was more silent. I can not complain of anything. Probably the most comfortable bed I´ve tried in my life. Arquitectural design of the hotel is beautiful. Parking lot very convenient in a town without many parking facilities. Convenient location to access other sites of interest. There was construction noise at 8am on Saturday morning, but after calling 3 times to the reception, they stopped it. Awesome location, staff and facilities. One of few downsides was that there was no complementary coffee or water in the room. The bar would not allow wine to go to room in a real glass but insisted on plastic. Food prices are high at about $20 per main dish. Local restaurants are much cheaper. When we arrived nobody took care of our luggage nor took us to our room.